This is perhaps the most accurate description of why, once I started, I continued to practice yoga. Physical exercise, sure, but mainly because it’s helped me manage better my stress reaction. Think calm blue ocean, calm blue ocean, calm blue ocean. 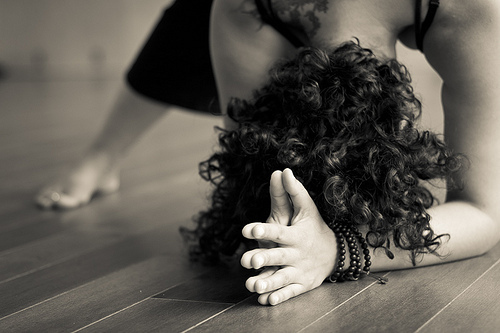 via Yoga: Changing The Brain's Stressful Habits | Psychology Today. My leg muscles almost always start to shake when I hold uttanasana. Standing, folded forward, pressing my feet into the mat to encourage my legs to straighten a little more and my tailbone to move closer to the ceiling, my legs inevitably start to wobble. In uttkatasana (chair pose) that wobbling is even more pronounced, and usually accompanied by a burning in my thighs. Uttkatasana and I have a love-hate relationship. I often have students ask me quietly and sheepishly after class what’s happening to them when they get the shakes in class. The first thing I tell them is that this shakiness is not uncommon. It happens to almost everyone at some point. For me it’s in uttanasana and uttkatasana; for others it could be the warrior poses. Usually, it seems to be poses asking for strength from the muscles. Yoga Journal has an excellent explanation for what’s going on anatomically. Muscles are made up of many fibers. When a muscle is used, not all the fibers contract at the same time. Some rest while the others work, and then they trade places. When the muscles are really challenged, the changeovers can get a little ragged. A little bit of shaking is okay — it’s a sign that you’re challenging yourself — but really shaking could be a sign to take it a little easier. Use the breath to decide how much shake is too much shake. If you’re shaking but you can still breathe slowly and fairly calmly, then you’re probably okay. But once the shaking starts to affect your ability to keep the breath slow it’s time to back off a little. And remember that point will be different for everyone — and will probably depend on the pose. If you’d like to read the rest of the Yoga Journal article, you can do so here.